After a flurry of app development when mobile devices first debuted, it's looking like most of the life-changing mobile software has been thought of, written and distributed. Sure, there will always be a must-have new app that comes along every once in a while, but for the most part, we already have what we need. Not true with mobile attachments, a tech that is still in its infancy as creative people continue to figure out new and innovative ways to use a smartphone's hardware. The spy lens is a terrific example of this trend. 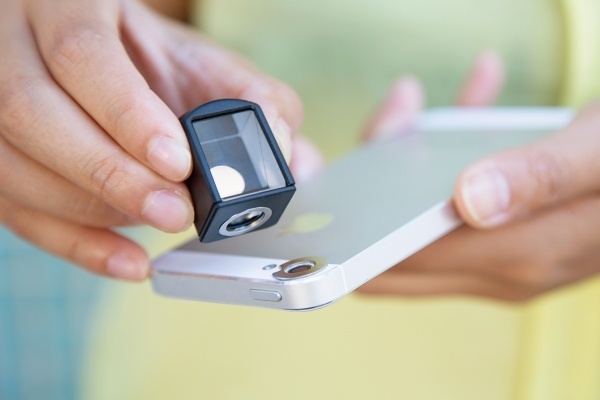 Snap it on your phone to take photos at a 90° angle to wherever you are pointing it. Slyly hold your phone in texting position, while shooting straight ahead. Snap candid shots of your camera-shy kids. Or just take a photo of your dinner plate without having to climb up on the table.